You can hire Clambers for 2 hours in the evening for exclusive use! If you want to really make an impression, Clambers can be all yours, so you and your friends can have crowd free fun! These are great for: Family get togethers, Christmas Parties, Birthday Parties, Discos, Wedding Receptions, Corporate Parties, Fun Casino Nights (We can arrange the tables for you), Charity Fund Raisers or any other party you want where you want Clambers to yourselves. 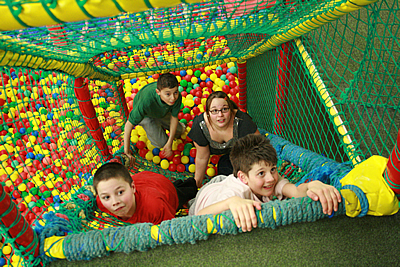 This allows adults to enjoy themselves why the children can play and be supervised by our staff. For larger groups please contact us on 01424 423778 for further discounts. Confirm options with £100 Deposit, non refundable. Members always pay £1 less per child. Take a look at our Membership page for full details and prices and further membership promotions and discounts. Please call 01424 423778 to become a member to get this discount. Lines open 9.30am - 5.30pm 7 days a week.